The South Africa Green Economy Barometer, published by South African thinktanks the African Centre and Trade & Industrial Policy Strategies (TIPS) and supported by the Green Economy Coalition (GEC), is a detailed analysis of the state of the Rainbow Nation's transition to a sustainable, inclusive economy. Based on new research, interviews and the expertise of in-country analysts, the report lays out clearly what has worked and what hasn't across five key thematic areas, and identifies future opportunities and challenges for greening Africa's largest economy. Overall, the report finds that South Africa’s transition to a low-carbon, sustainable and inclusive future is stuck in first gear, with ambitious policies on paper but slow progress on the ground. The South African economy remains locked into ‘brown’ energy systems and investments, the benefits of which are not reaching most people - but particularly the poorest. 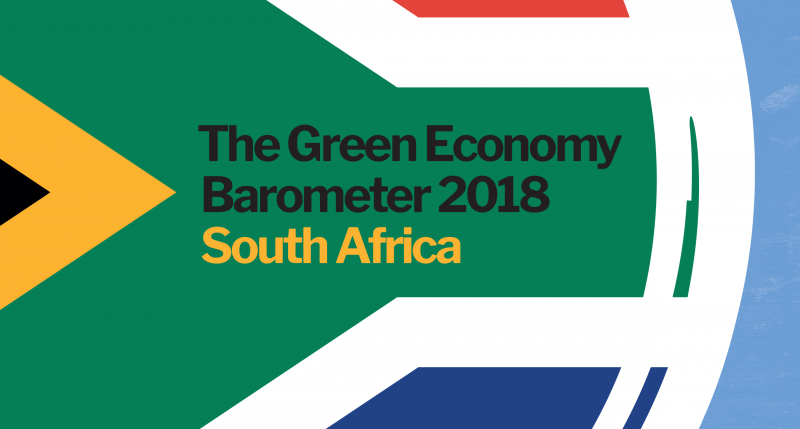 The barometer therefore rates South Africa’s green transition at only 5 out of 10. Serious institutional and governance failures have allowed systemic problems like the Cape Town drought to go almost unchecked. More than half a decade on from the world-leading 2011 Green Economy Accord and the 2012 National Development Plan (NDP), which together set out to transform South Africa into a low-carbon, climate resilient and just society, the country remains worryingly inefficient, unsustainable and unequal. There are some bright spots. Urban transport systems and manufacturing are becoming less resource intensive. There are more protected and conservation areas in South Africa than ever before. And the country has pioneered some key innovations in sustainable finance in recent years. But South Africa’s ecological footprint continues to exceed the country’s biocapacity, and key biodiversity hotspots remain in a dire state. There is little awareness of the value of nature or natural capital in government decision making. And marginalised people and the informal sector are too often forgotten in national efforts to grow and green the economy.